266 pages | 5 B/W Illus. Presenting the voices of a unique group within contemporary Japanese society—Zainichi women—this book provides a fresh insight into their experiences of oppression and marginalization that over time have led to liberation and empowerment. Often viewed as unimportant and inconsequential, these women’s stories and activism are now proving to be an integral part of both the Zainichi Korean community and Japanese society. Featuring in-depth interviews from 1994 to the present, three generations of Zainichi Korean women—those who migrated from colonial Korea before or during WWII and the Asia-Pacific War and their Japan-born descendants—share their version of history, revealing their lives as members of an ethnic minority. Discovering voices within constricting patriarchal traditions, the women in this book are now able to tell their history. Ethnography, interviews, and the women’s personal and creative writings offer an in-depth look into their intergenerational dynamics and provide a new way of exploring the hidden inner world of migrant women and the different ways displacement affects subsequent generations. 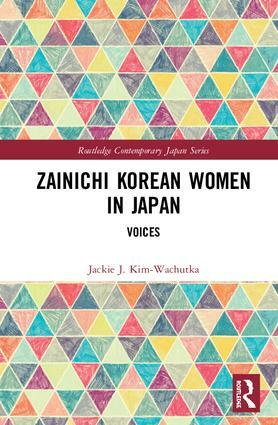 This book goes beyond existing Anglophone and Japanese literatures, to explore the lives of the Zainichi Korean women. As such, it will be invaluable to students and scholars of Japanese and Korean history, culture and society, as well as ethnicity and Women’s Studies. Jackie J. Kim-Wachutka teaches at Ritsumeikan University, Kyoto, Japan. She is currently researching Japan’s multi-ethnic aging and care, women’s performativity of patriotism, and feminized hate speech.